Introduced in 1967, American Train & Track (AT&T) offered HO-scale freight car selections imported from Austria to North America. These Roco-made freight car models saw inclusion in other hobby company catalogs, including AHM, Model Power, and others. 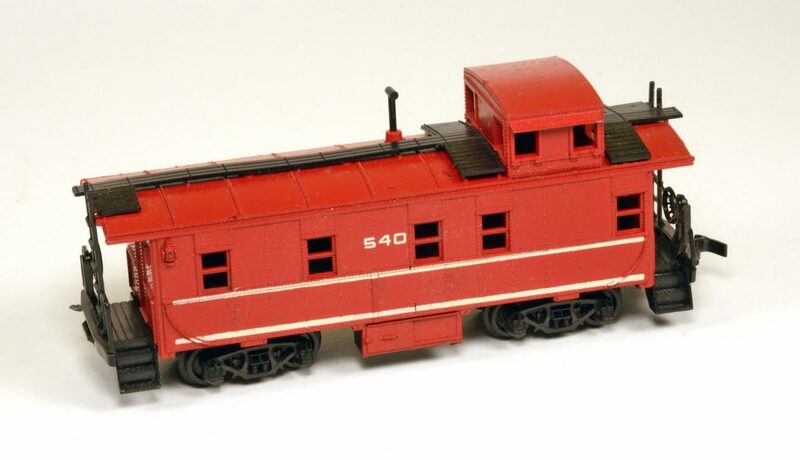 This standard cupola caboose served as a separate sale release and was included in train sets offered by AT&T. For 1967, five road names appeared in American Train & Track’s catalog. At least three additional releases followed in 1968. Similar to the situation for AT&T’s boxcar offerings, when new roads arrived they occasionally replaced past offerings. For example, the 1967 stock number 495 was a Pennsylvania Railroad release, but in 1968 is replaced with Penn Central as 495. The assembled caboose included black molded plastic end ladder, brake wheel, and handrail sections that snapped into the underframe that included the end porches. The cupola is a separate color-matched section on this model. The running boards and smoke jack on the roof are separate black molded plastic details. American Train & Track’s caboose retailed for $2.98 in the late 1960s.